Posted on May 11, 2017 August 1, 2017 by John Novosel Jr.
We just completed another mind blowing or should I say speed blowing golf school. It never ceases to amaze me the speed increases our students achieve. In this blog, I’m going to break down what we do and how we do it. These swing characteristics lead to low CHS, he was around 98 mph and inconsistent shot making. His 6 handicap comes from pure athleticism and competitiveness (not from his swing). 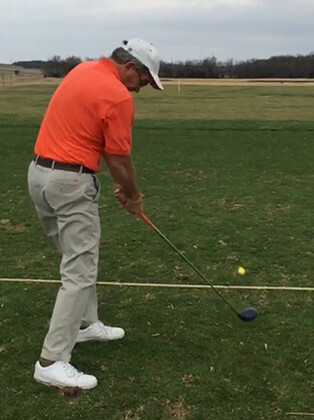 Student #2 is a 65 year old golfer that is in decent shape with pretty good speed, around 90-94 on a driver. However, he struggles with coming over the top and hitting a massive slice. After getting their ‘before’ videos and ‘before’ launch numbers, we then start the training. 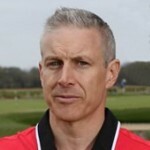 If you follow my blog at all, you know that the training does NOT involve hitting golf balls. That is a tired paradigm and not effective at changing motor skills, especially when you’re working on speed. We begin the training with SpeedBall. It’s not anything crazy special, it’s Y Drills, L drills, one arm swings and then tempo work with the SpeedBall. The thing that we do THAT IS SPECIAL is that we do each drill exactly right. We do them slowly and feel what we’re doing. Then we progress in speed while maintaining proper form. For those of you new to training (of any sort) that is called a progression. For some unknown reason, the world of golf has lost track of that word. We think that we can just go play golf and/or change a (subconscious) motor skill on the while hitting balls on the range. No other sport works like this, especially sports where proper form is a must. Anyway, I digress, back to the training. Then from there we progress (there is that word again) to speed training with the SpeedBall and this is where the magic really happens! If you do any of these 3, you get a gain in CHS. If you can do ALL 3, you get the amazing speed gains we see with our students. We have specific training aids and protocols for these 3 important keys. 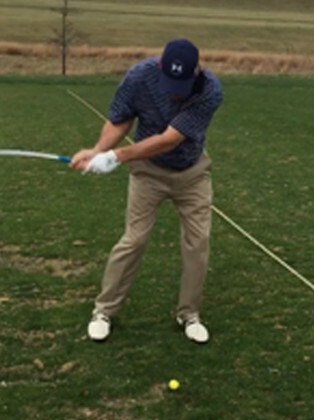 Mechanics/LAG: The Lagman and PowerAir (with Power Whip) create a new paradigm and feel for the golfer of creating the angle and maintaining the angle in the swing. First we learn it slowly, then we PROGRESS to more speed. When this is done even a few times, lag improves. Also, both of these training aids incorporate a SAID element, so the increased lag becomes lights up new muscles and neurons in the brain, which truly make it deliberate practice. If I understand where we are headed, it sounds like we will create conditions where lag is created and maintained on it’s own and requires no holding off or conscious thought to maintain? RESISTANCE: Once we’ve done this, we then PROGRESS to full speed swings with the SpeedBall with Power Module. The SpeedBall with Power Module gives the golfer perfectly applied resistance at impact and tells the brain you have some serious resistance you need to overcome. The brain begins to recruit more speed & power knowing it has to swing THRU the hitting zone and get thru the Impact Target. Brady’s first few swings were 110-112, and then with each swing he started to realize that he can swing faster and faster. He was able to reach a high of 121 mph, which is truly incredible when you consider his casting motion/speed he started with just 1 day prior. This is a gain of 15-20 mph of CHS, which will lead to Brady driving the ball 30 to 40 yards farther. Go back and read that one more time, it’s crazy to think that happened in a 2 hour session. But it does show what we are all capable of when we train wit the correct tools and protocols. John had a similar speed increase going from 92 mph to 107 mph. With that speed increase he will pick up 30 yards, but it might be more because he was losing yardage due to a poor smash factor and a slice. TEMPO: We then put it all together with Tour Tempo. 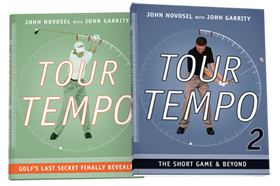 The tones of Tour Tempo help the golfer to QUIT thinking and just be athletic and reflexive. It allows you to take your new swing/speed to the ball and the course. Since the tones never change (time-wise), you are able to create consistency. When done correctly, this progression produces incredible speed gains. 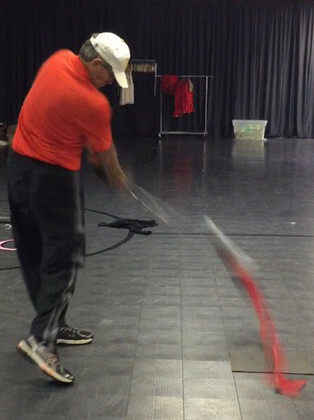 Even better, our golfers improve mechanics/squareness at impact! Let’s take a look at John’s swing in this before image. He has the classic OT move and hits a weak slice. His path on the FS was 10-14 left. Ideally, we want the path to be less than 3. The other thing you can see from this video is that John ‘leans’ into it and this causes all kinds of issues, the main 2 being inconsistency and also reduces rotation which reduces speed. 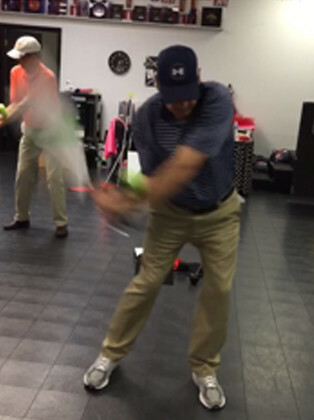 We put John thru the training and look at the amazing difference when swinging the speedball. His path is now zero (if not a degree right), he’s not leaning into it and he’s getting off of his right side to create more power. It’s a total transformation. As he works daily/weekly and does the drills this will become his ‘real’ swing and the results will be dramatically better. Take a look at this image of Brady. He’s halfway down and lost all angle, and thus all speed. Now take a look at Brady training using the PowerAir. He’s creating lag, he’s feeling lag and he’s also getting resistance. All this translates into a better swing and just as importantly faster learning. His brain/body are feeling things they’ve NEVER felt and by lighting up the brain/muscles, he will engrain this pattern faster.